Here are top selected products for "Footwear"
Footwear has evolved from the early protective sandals to brogues and Oxfords. Not a just a necessity, the pair shoes you choose to flaunt are an extension of your personality. Today there are lots of options in footwear for men and women that can be worn to formal as well as casual occasions. At Snapdeal, you will come across a wide assortment of footwear for men and women. You will be able to choose footwear from brands like Puma, Myra, Forest, Macoro, Reebok, Paragon and many more. If you are looking for formal or casual footwear, then you must shop online at Snapdeal and choose from a wide range of men's, women's and kid's footwear. When it comes to footwear, men are very specific about what shoes they wear. From comfort to looks, everything should be taken into account before you buy a pair of shoes. Every man must own a pair of classy formal shoes. You can opt for formal shoes from Red Tape, Lee Cooper, Nike, Zovi, Clarks and others. You will be able to opt for slip-on formals both available in brown and black. If you are not comfortable with slip-ons, then you can opt for lace-up mens formal shoes. There are many designs available for you to choose from. If you are looking for mens sports shoes or sneakers for men, at Snapdeal you will surely be spoilt for choice. You can opt for high ankle shoes, regular sneakers and sports shoes. They are available in a range of colours as well. At Snapdeal you will also find slippers, floaters, boots for men, flip-flops, specialty shoes and more types of men's footwear. 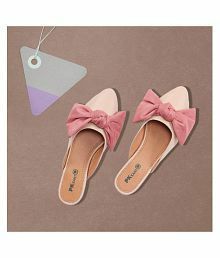 If you are looking for women's footwear, be sure to check out the wide variety of bellies, heels, boots for women, flip-flops, gladiators, formal pumps, flats, stilettos, wedges, floater sandals, sports shoes, heeled sandals and more. You can opt for colours like beige, black, blue, white, ghost white, gold, grey, khaki, pink, peach and many others. At Snapdeal, you will find women's footwear for formal, casual and also festive occasions. If you want footwear for your children, then you will also find exactly what you are looking for at Snapdeal. You can also check for women shoes online at low prices here at Snapdeal.com. If you want to make a statement with your footwear, then why wait? Shop online at Snapdeal for men's footwear, women's footwear and kid's footwear too, at best prices in India on Snapdeal - India's best online shopping site. What makes that long walk worthy of your time and energy? It is nothing but the perfect footwear that does not let you feel the roughness of the rocky footpath. Finding the perfect footwear that fits your feet perfectly and provides you the comfort that you have been longing for is a task. A shorter footwear will make you feel like your feet are getting crushed and a bigger one just lands you in a deeper trouble with your foot coming out every step you take. Apart from your apparel, your footwear has the most variation, in accordance with the occasion. Shoes range hundreds of occasions! There are shoes for marathon, different ones for your board meetings, some for your parties, and the list goes on. Different criterion need to be kept in mind while choosing your footwear accordingly. Got a marathon to run for? Do not always hover around your favourite brand. For marathons, walk-a-thons and similar events, the weight of the person running / walking makes up for the most important criteria. Consequently, the manner in which you run or walk decides how much pressure will be falling on the sole of the shoes. Therefore, to be precautious enough that your footwear does not wear out easily, do run it by someone about what will suit your foot best. The platform of the shoe is also very important. Since while running or walking, a lot of pressure falls on the platform of the shoe - so care should be taken to choose the right one because if the shoes’ soles wear out because of a low/poor quality platform, you will run yourself into unnecessary issues. It is no new information that the comfort of your heels will decide if you have a good time at your party and do not end up walking barefoot because of those increasingly uncomfortable heels. High heels are definitely tempting, but it is not certain whether every high-heel footwear is going to suit everyone. If your shoes have a very high heel, make sure that the sole under the frontal part of your foot is high enough. A high sole / platform will elevate your foot and hence make it more comfortable than other shoes with thin soles. If you are going for stilettos, make sure the thin heels have the stability. The stability of the heels is directly proportional to the comfort that you can expect from the shoes. Choose the right shoe and dazzle up your party! Think you got the right flats? The thing that comes with choosing the right flat footwear is to choose the material that the insole is made of. Do not look for only the right look, search for what comforts you the most. It becomes difficult because the insoles come in varieties: synthetic, hard insoles, leather, cushiony, cotton, and nylon among others. The material should suit your skin so that your foot does not have blisters. Each kind of flat footwear has a different kind of ending. Some have a pointed-toe ending, low-cut toes, square cut and many others. Depending on what your feet are like, you can go for an appropriate flat shoe. For example, if you have a longer foot, a low-cut flat will make it extremely uncomfortable for you to walk on any surface even if you got your material right. Therefore, choosing the right footwear, irrespective of the occasion, comes with a decision which is a combination of choosing the right insole material, the right platform and the heels! This decides the fate of the rest of your day. The more uncomfortable your shoes are, the weirder your day gets. Therefore, a good-fitting footwear will be the deciding point of what your mood is going to be like. You definitely do not want your feet to be crushing in a badly chosen footwear before an important meeting or before you go for a marathon. The deal does not end with choosing the right fitting, it ends with looking for the appropriate material that is used to create the part of the footwear that provides a support base for your ankles. Your ankles tend to get tired faster than any part of your foot, so watch out for those uncomfortable ankles prepared to ruin your day. Choose your shoes wisely. You can also check for heels sandals. Your footwear might be perfectly fitting your foot but the important thing is to see if, after putting on your footwear, there is room enough so that your arch has space enough to settle for longer hours. The arch in your foot should be able to take the burden for a long period of time hence the ‘spacious’ factor while choosing your shoes while online shopping is an important one to take note of before making any purchase.